In the 1800s, 90 percent of the U.S. population lived on farms and produced fruits, vegetables, meats and dairy products for their families. Today, 2 percent of the population produces our food through mechanized farming. AGRITOURISM is a business venture on a working farm, ranch or agricultural enterprise that offers educational and fun experiences for visitors while generating supplemental income for the owner. 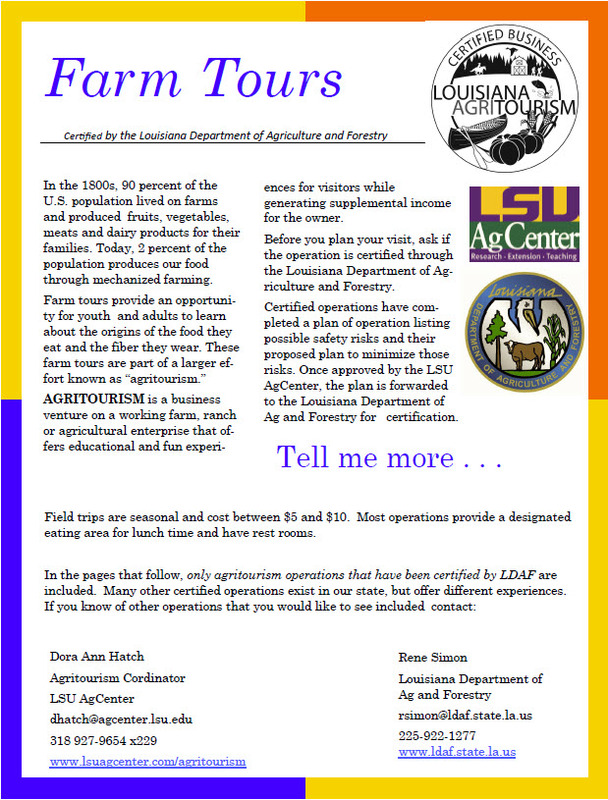 Before you plan your visit, ask if the operation is certified through the Louisiana Department of Agriculture and Forestry. Certified operations have completed a plan of operation listing possible safety risks and their proposed plan to minimize those risks. Once approved by the LSU AgCenter, the plan is forwarded to the Louisiana Department of Ag and Forestry for certification.